1.) 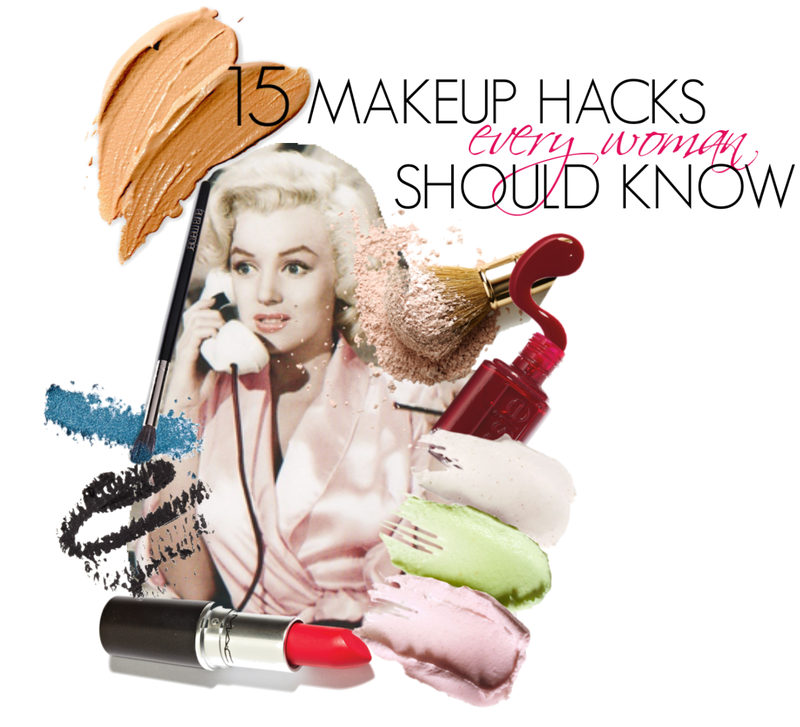 Make lipstick last longer: Lightly cover your mouth with a tissue and apply some translucent powder over the top. You can find out exactly how to do this on this blog post of mine. 2.) DIY Gel liner: Place your kohl pencil liner under a flame (you can use a lighter, candle, etc.) for 2 seconds. Let it cool for another few seconds and apply as usual. The result will be gel-like in appearance and much darker. 3.) Lipgloss running out? Place the closed lipgloss tube in a cup of warm water for 10 minutes. The heat will melt gloss stuck on the sides of the container and cause them to drip to the bottom so you can use every last drop. 4.) Get extra curly lashes: Use your hair dryer to heat your lash curler for a few seconds and then curl your lashes as normal for an extra curled boost. eye shadow to intensify the color. 6.) Fake bigger lips: Line your lips with lipliner before applying lipstick and then dap a shimmery light eyeshadow in the center to create the illusion of a bigger pout. 7.) Quick blush on the go: Apply a dash of lipstick to your cheeks and blend out with fingers. 8.) Exfoliating body scrub: Mix one part coconut oil with two parts sugar for a scrub that will leave your legs silky smooth. 9.) Out of shaving cream? Use conditioner or coconut oil for nutritious hydration. 10.) Cheap blotting papers: Next time you hit up starbucks for your coffee fix, grab a bunch of their brown napkins. Apparently they work amazing as blotting papers! 11.) Preserve volume in hair: Tie your hair into a top-knot at night to keep volume at the root of the hair. 12.) Make eyes appear bigger: Line your waterline with a white kohl pencil instead of black to make them pop. 13.) Rip proof tights: Lightly spray your tights with hairspray to avoid rips and tears. 14.) Foil your eyeshadow: Intensify the look of your eyeshadow by dabbing your brush in some water or eye drops prior to application. 15.) Exfoliating face mask: Mix baking soda and water together so that it forms a paste. Apply to face and wait 10 minutes before washing off. You can find out more about this amazing DIY face mask on this blog post of mine.